Have you ever wondered whether other organizations are finding Facebook effective? Idealware conducted a survey of the staff of 505 non-profits in February to find out if they are actually seeing results on Facebook. 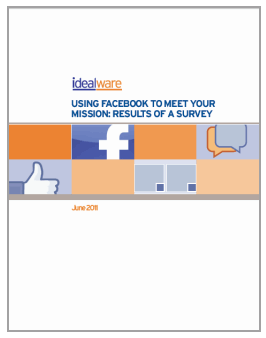 And now their report: Using Facebook to Meet Your Mission: Results of a Survey is available. Is Facebook effective in attracting new constituents or inspiring people to action? How effective is Facebook at raising awareness? …you can download the Idealware survey report here. Brian: Thanks for sharing your perspective. While the report may only serve to confirm our hunches, it's interesting to see the aggregated survey results. Jennifer: thanks for sharing the white paper.